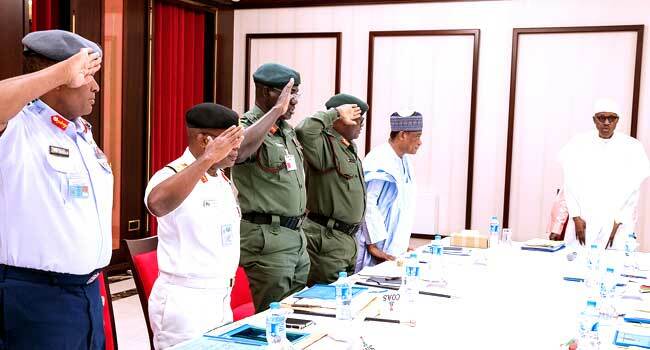 President Muhammadu Buhari is currently in a meeting with the nation’s Service Chiefs at the presidential villa in Abuja. The meeting is also being attended by the Vice President Yemi Osinbajo, the Corps Marshal of the Federal Road Safety Corps (FRSC), as well as the Comptroller General of Immigrations. Although the agenda has not been made known, the meeting may not be unconnected with the current security challenges in the country, particularly, the continued attacks by suspected herdsmen in parts of the country, especially the north-central states. 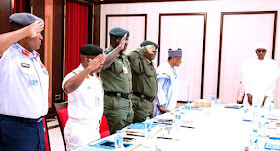 President Muhammadu Buhari has come under severe criticism over his handling of the security challenge, but he has refuted the claim of sloppiness in his approach, saying he has since given orders for necessary action to be taken by the security agencies.